Mahendra Kumar Jain, the proprietor of the M.R. Roller Flour Mill - established at Agricultural Land at Mantripukhri area was arrested today by City Police on charge of fraudulence. According to police source, Mahendra Kumar Jain was arrested after SBI Head Office Manager lodged a complaint against him over failure to clear loan debt. He is expected to be produce before the CJM Imphal West today evening. As per complaints Mahendra Kumar Jain had not been paying the loan debt since May 17, 2017, the source said. However, the bank did not mention anything about how he managed to get the loan amount as this newspaper had reported that all documents he used for procuring the loan were fake. On May 21, this year Imphal Times published a report on how Mahendra Kumar Jain had taken loan amount of Rs. 8 crore from the State Bank of India using fake documents. The report was reacted by one civil society body ACOAMLUP urging bank authority to clarify on how could a person, who is also a non local be granted a loan of Rs. 8 crore with fake documents. The following day Mahendra kumar Jain during a press meet stated that he will sue defamation to the newspaper reporting about the matter. This news paper had also reported that Mahendra Kumar Jain besides failing to pay the debt had not filed any Income Tax returns since the financial year 2015-2016. 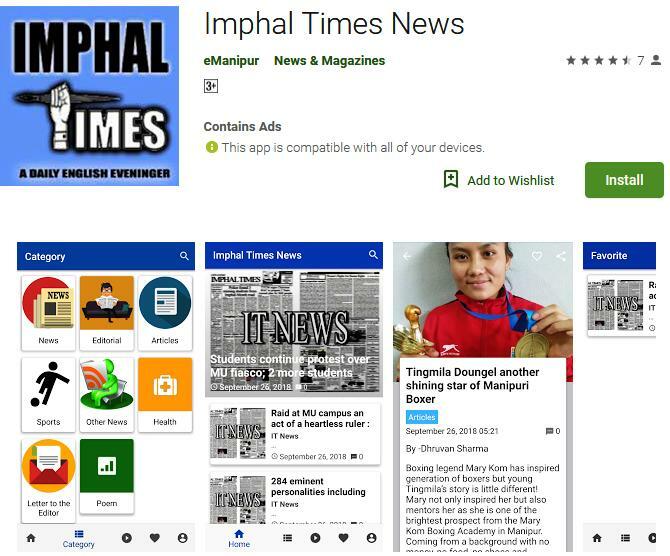 After his clarification to media on the news report, Imphal Times countered the clarification stating that Mahindra Kumar Jain had once more cheated the media by showing documents with concocted story. This newspaper has published that the Jamabandi he submitted to the bank is 0.66 acre area while the original Jamabandi showed that the actual area is 0.11 acre. Imphal Times had showed every detail of the Bank account and Pan card and Tin no. in our earlier issue. The same was produced by a civil society organization ACOAM Lup during a press conference held. Until recently it remain a mystery on how the Proprietor of M.R. Roller Flour Mill could managed to get a loan of Rs. 8 Crore without much difficulties or say without much checking of the documents submitted by him, it was found that he had a good record in the SBI. Following the news report, a vigilance team from the Regional head office of the State Bank of India had come to Manipur and investigated the matter. However, the findings was kept concealed by the bank authority, saying that the matter was internal. Hearing of the petition filed by Vice Chancellor AP Pandey at Manipur High Court has been differed on September 17, 2018. The case was referred to a higher bench comprising of Chief Justice Ramlinga Shadhakar and Justice Kh. Nobin by Justice Kotishwar. Professor AP Pandey filed the petition against the Union Government of India and Manipur University pleading to quash the Memorandum of Understanding signed between the MHRD, MU Community and the Government of India on August 16 and also to rule out the Enquiry committee. After hearing the petition the double bench today differed the hearing on September 17. Meanwhile, the enquiry committee constituted to enquire the allegations against the VC AP Pandey had begun its proceeding since yesterday. A sitting of the committee headed by Retd. Acting Chief Justice T Nandakumar and Former VC MK Choudhary had a sitting today and had a sitting today at Hotel Classic Grande. On the other hand large number of students today storms the governor Bungalow at around noon today against the inaction of the government toward the high handedness of Prof. AP Pandey and Prof. Shyamkesho. Police present near the governor bungalow and the agitators had a minor confrontation. 100 hours blockade called at Imphal Jiri road from Sept. 8. All Manipur Students Union has called 100 hour blockade along Imphal Jiribam Road from midnight of 8 September . The bandh called was announced today during a press conference held at the office of AMSU. It may be mentioned that some miscreants identified themselves to be cadres of NSCN-IM had assaulted a team of AMSU while returning from Jiribam at Nungba. NSCN-IM had yesterday clarify that those who assaulted the members of the AMSU does not belong to the NSCN _IM had clarified that two among them have been in the custody of the NSCN-IM. The Ereipak Eramdam Chanura Chaokhat Loinsilon ,EECHAL,Assam formed it’s full fledged committee on this Friday here at Assam Manipuri Sahitya Parishad bhavan at Silchar in Assam. A Peoples convention on “Manipuri Women of Assam and Development” was also held where good known scholar Dr.Khaidem(o) Merina and activist Ngangbam Moiranglei were spoke as resource person. The event were also graced by Tongbram Ebemcha , president of the EECHAL ,Manipur while A.Lily ,president of the Assam Manipuri Meira Paibi Apunba Lup,AMMPAL and Sanathoi Devi, vice president of AMMPAL were also attended as guest of honours . H.Watembi Devi, Secretary General of EECHAL,Manipur while delivering her key note address stated that the main motive of formation of the Assam chapter of EECHAL is to bring integration amongst the Manipuri womenfolks of the inner and outside Manipuri. She also emphasized that EECHAL will works for the protecting and promotion of the identity ,integrity and prestige of the Manipuri women of the region. Later in the meeting, a body unanimously resolved to select 17 members executive council body of EECHAL, Assam. Amongst other, Yumnam Molina and Khangjrakpam Nilima were selected as President and Secretary General of the EECHAL,Assam while Lakhimani Singha, Sagapam Hemoprava, Ashangbam Chingkheinganbi and Mutum Ashalata were also selected as Vice President , Joint Secretary ,secretary information and publicity and Secretary finance respectively. It is just around a week from today that the “World Bamboo Day” will be observing throughout the world. In an ever increasing need to replace and supplement the man-made materials that is being utilized to fuel the constructions and creation of infrastructures, newer avenues and innovative use of natural resources are being taken up in a big way. One of the most promising and abundantly available natural resource of building material being bamboo, the world is taking a renewed look at this ubiquitous grass to sustain and fuel buildings and other infrastructures of the future. The inherent advantages of this unique material has only been starting to be appreciated- from the climate friendly and relatively economic attributes to the added aesthetics and versatility, not to mention its unique ability to sustain and thrive in diverse climatic conditions. Yet so far, apart from celebrating the day and waxing eloquence on the subject once a year, precious little have been done by the State authorities, nor has there been any support or visible effort by the Government to infuse the private entrepreneurs to work with this wonderful material and develop commercially viable products. The most glaring point being the lack of any facility for treatment of bamboo- a prerequisite step for development of any product using bamboo due to its propensity to attract termites otherwise. Manipur is naturally endowed with an abundant supply of huge varieties of bamboo, and cultivating them commercially will not be a formidable task, given the conducive climatic conditions, yet the lack of infrastructures coupled with the lackadaisical attitude of the Government in making these infrastructures available as well as the indifference shown in taking the initiative in promoting and encouraging the individuals and organizations in their efforts to develop and popularize bamboo products has so far resulted in the precious and versatile material being relegated to temporary substitutes for fencing and as makeshift scaffoldings- a huge waste of efforts. For a fund-starved State with very limited opportunities for gainful employment such as Manipur, the humble bamboo grass presents the perfect opportunity to enable the society to pole-vault itself out of the pit of misery and trouble it is in at present. A sustainable system for value addition and marketing the products with a planned approach towards the development of artisans and adequate raw materials will ensure that our naturally endowed State benefits from such a venture. Today, the people of Manipur floored on with curious to insight the hidden desire of the Vice Chancellor of Manipur University; rather exposed to be answerable subject of the H.R.D. Minister, as well as, Governor of Manipur. The prevailing atmosphere in M.U. carrying prolonged strike of MUSU, co-ordinating students bodies and teachers bodies against Prof. A.P. Pandey, reject Prof. Pandey to be V.C. The People of Manipur have been continuously watching the situation of M.U. as well as the responsibility of the Authorities, leaders of the Nation. Indeed responsible leaders have to appropriate the academic career of the 30 thousand students belonged to Manipur University. Otherwise, chances of wild fire round the corner in Manipur. Prof. AP. Pandey creates the situation, hence he has been scanned with the constitution of an enquiry against him. He has been sent on leave after appointment of the In-Charge V.C. But, I/C VC. endeavouring to bring normalcy in the campus; in the meantime, Prof. Pandey has declared himself joining from leave. At the same time he has submitted petition to the High Court, to justify himself right, for the wrackage of administration in M.U. Violating the norms of the inquiry and law of the land against him, rather by passing upcoming inquiry findings, which is necessary to be awaiting, Prof. Pandey once again trying to expose himself stubborn, irresponsibility and unsocial in public by ignoring the law of the land, by overlooking the academic career of the 30 thousand students, would be anti-social. At this point of time our conscious is culminanting upon the H.R.D. Minister for not advising the rejected V.C. Prof. Pandey, for enduring to wait the inquiry report; rather than, the V.C. is also showing political backing behind the crime. Therefore, he is bold looking even been discarded him in the Campus. But, Shri Narendra Modiji, the Prime Minister of India and Shri Yogi Adityanathji like personalities also must be associated from among the ruling govt., so that such deficiencies would be removed from the administration. Because, both of the leaders of the Nation are examples of clean career who can properly deal such corrupt V.C. at the earlier possible time. Because, both leaders have care of the nation; zero interest in family related matters. Otherwise, the ruling govt. and leaders might appear such incident frequently, which is national problem. At such point of time Her Excellency Governor of Manipur could have intervene the maladministrational problem coming up in the Manipur University. Such incident has frequently been occurred in Manipur due to lack of administration, lack of transparency in administration; selfish administration, mind sided administration exist in the corner of the top bureaucrats/leaders of the nation. This is the lack of democracy in the multi-party Parliamentary System of India; which can only remove by clean hand of the leaders. While inaugurating the workshop that was held at the Imphal Campus of IBSD, Y. Khemchand Singh, Speaker of Manipur Legislative Assembly, lauded the initiative of IBSD and promised his support for bringing together all stakeholders for convergence of actions and implementation. Prof Dinabandhu Sahoo, Director IBSD, expressed the urgent need to reverse urban migration through such interventions aimed at promoting Rural Bio-entrepreneurship by developing bio-based industries in rural areas that would not only double farmers’ income but also generate jobs and livelihoods for the unemployed youth. The action plan document is being developed under the chairmanship of Dr A.K. Singh, Secretary, National Academy of Agricultural Sciences (NAAS), said Sahoo. Other experts who also participated in the deliberations include Dr Ajay Parida, Director ILS ; Dr U.K. Behera, Dean CAU ; Dr Umesh Kohli, Director IHT ; Dr DD Haokip, APCCF, Govt of Manipur; Shri Th. Mohendra Pratap Singh , CCF Govt of Manipur ; Dr Syed Kazi, Hon. Director NEDF and several representatives of civil society. Popular Front Kerala state general secretary, CP Muhammed Basheer filed a complaint to News Broadcasting Standard Authority against the derogatory remark made by Republic TV Editor in Chief, Arnab Goswami, against people of Kerala. CP Basheer, in his complaint, alleged that Arnab racially insulted Malayalis and violated journalistic ethics. He said that according to NSBA rules, the first complaint had to be made to Channel Broadcaster and that had done accordingly. If action is not taken within a week, he would file the second complaint. Arnab made the derogatory remark against Kerala in Republic TV prime time discussion on August 25 with the hashtag “Flood Aid Lie”. “Most shameless bunch of Indians I have ever seen”, said Goswami referring to Malayalis during the discussion. It was clear that Arnab Goswami who serves as the mega phone of the Central government held the discussion with the sole intention of establishing that 700 crore aid offer of UAE was bogus. He tried to create the impression that people who disagreed with him received foreign fund to work against the country. A facilitation centre to register aspirants for the post of Constable / GD in CAPF has been established in Tupul & Noney by 86 Bn CRPF, under the aegis of Manipur & Nagaland sector, CRPF to assist the local youths. Local youths are submitting online application for the post of Constable / GD in CAPF and Rifleman in Assam Rifle for which Staff Selection Commission will conduct online written examination and thereafter Physical Standard / Physical Efficiency test will be conducted at various places in Manipur . As per the advertisement by SSC total vacancies are 54953 and last date for submission of online application is 17/09/2018. Boys and girls who are 18 years to 23 years can apply for the post and 05 Years age relaxation is available for schedule tribes and schedule caste candidates. Sh. Kalyan Singha, Commandant 86 Bn CRPF briefed aspirants during his visit to the Tupul / Noney area and assured them that he will extend full Co- operation to local youths in online submission of application for the post of constable / GD. A lecture on health awareness was conducted by Thoubal Battalion of 9 Sector Assam Rifles under the aegis of HQ IGAR (South) by Chandrakhong Company Operating Base at Children Training School, Souraland on September 6. Approximately 78 students and 7 Teachers, to include school principal attended the interactive session. The company Nursing Assistant briefed the students and teachers about the common practices to maintain good health and hygiene, importance and contents of a basic First Aid box and handling of snake bite cases. The locals were extremely grateful to the unit for this earnest endeavor and requested for more such camps in near future for the benefit of local populace.